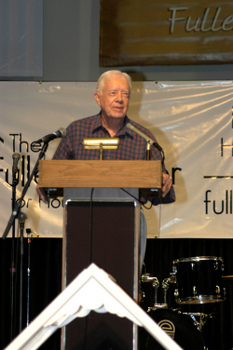 Former President Jimmy Carter and his wife Rosalynn kicked off their 27th annual work project with housing nonprofit Habitat for Humanity in Northeast Washington, D.C., today. Between hammering nails and raising walls in the chilly rain in front of a throng of news cameras, Carter took a moment to endorse another housing nonprofit, The Fuller Center for Housing, for a plan to build houses in North Korea, set to begin shortly. "They’ve already gotten permission from the government of North Korea to come in; they’ve already had a team there to assess the construction possibilities. This has to be a very flexible thing because as you know all of the houses in North Korea are owned by the government," Carter said. "We’re just thankful that we’ll be able to get some houses built in North Korea for people in need." The Fuller Center was founded in 2005 by Millard and Linda Fuller after they had a fall-out with Habitat, which they also founded and ran for 29 years. Click here to learn about the initiative The Fuller Center is launching in North Korea. Fuller Center president David Snell just returned from Pyongyang. Check out his blog for details, video and updates from the trip. Read more about the long friendship between the Fullers and President Carter in the Fuller Center History Timeline.